Wexford/CV proposal rendering. Eddy Street bottom, Ship Street left, Dorrance Street right. Click image to enlarge. Phasing is not really allowed by the 195 regulations, one is not allowed to land-bank. Something like this can’t really be built any other way than in phases though, so I guess we’re just ignoring that for reality. Also, I better not see any ‘temporary’ surface lots anywhere between phases. Developers will seek state incentives, but the amount and nature were not specified in the purchase and sale documents. The project also will seek a tax stabilization agreement with the city of Providence. 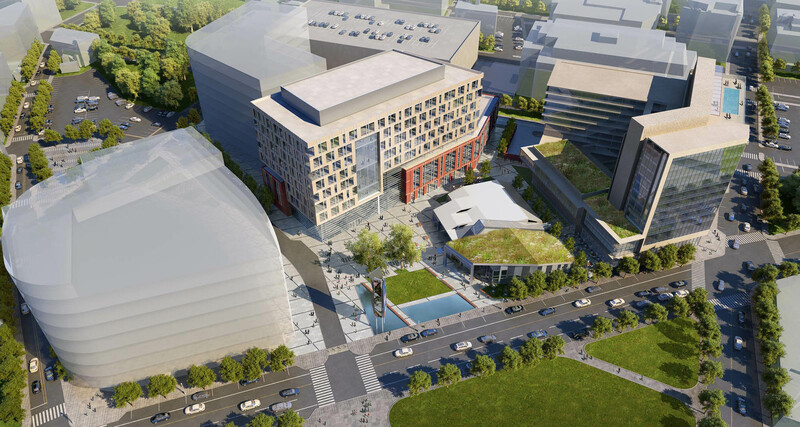 As part of the development, the Rhode Island Convention Center Authority agrees to build a 1,250-space parking garage, known as the Garrahy Garage, of which at least 400 spaces will be set aside for the Phase I portion of the bioscience development. Another 500 spaces would be needed for the latter phases, according to the purchase and sale agreement. Come for the parking, stay for the parking! In the first phase of development, the CV-Wexford team expects to build about 500,000 square feet of mixed-use development that will encompass research and development, lab and office facilities, an innovation center, as well as restaurant and meeting facilities and a hotel and residential complex, the commission said in a statement. The CV-Wexford team also intends to buy adjacent property, according to the purchase and sale agreement with the commission — One Ship Street, adjacent to Parcel 25 to the south, and 60 Clifford Street, now owned by Brown University and north of both Parcels 22 and 25. The 60 Clifford Street building has most recently been occupied by the former Nabsys life-sciences company. The purchase and sale agreement includes a detailed development schedule for all three phases of the Project, beginning with a 90-day due-diligence period, followed by 180 days to obtain building permits leading to closing on Phase I, according to the 195 Commission. If I’m reading the rendering properly, it looks like 1 Ship Street and 60 Clifford Street are slated to be razed. I kind of feel this missed the mark on the huge potential Eddy Street had to be a lively main arterial. The garage is across from the South Street Power Station project and massive interior setback across the from the park is like a private exterior of green space. I always felt a solid street wall and multi-mode transit on the asphalt would make it a killer secondary cluster. I’ll believe this Garrahy Garage when I see it. The proposed landscape plaza area in between the buildings will serve as a great public space which can be utilized by residents/employees of the new complex and pedestrians walking on Eddy St. I think its wonderful and a great use of the land. Can’t wait to see the shovels in the ground. Currently, Elbow Street wraps around the plaza that Brown built at the corner of Ship and Richmond Streets as a sort of service lane, could almost call it a woonerf (food trucks park there in the summer). In the rendering it looks like the plaza running through this property lines up with Elbow Street. If the rest of Elbow Street were to be upgraded to act as a woonerf, it would create a really lovely walkway through the heart of the District out to the waterfront. Jason. This rendering shows the park reaching out to Eddy/Dyer Streets, but across the street is actually a buildable parcel, Parcel 42. With the right building(s) on Parcel 42, the open space here could act as an enclosed room in the cityscape. It could be quite lovely. The facade of the hotel leaves quite a bit to be desired (beige concrete and grey glass? ), but overall, this is a gigantic score for the city, and will truly be an immense asset. I love the use of space on this. Also, did anybody see the other rendering out there for this? They showed it briefly on channel 10, but I haven’t seen it anywhere else.